Did you catch the headline yesterday that Harry and Meghan are back on Instagram, this time with a joint account? With the anticipation of the royal baby mounting, it's a good time to look back on Meghan Markle's fashion impact since she's come onto the royal scene. Her simple and sophisticated style, as well as her nod to sustainable and attainable brands, before and during her pregnancy, have both been well documented, and it's helped bring some under-the-radar brands, including Birdies shoes and Outland Denim, to the forefront. But as a recent article from Fashionista pointed out, the positive impact (Meghan wearing something) has on sales isn't necessarily long-term, though it does greatly boost brand awareness in the short-term. As the article states, it's really about what happens afterwards, how the brand promotes and leverages the momentum of the spotlight, to turn it into sustainable growth. Here's a few examples of how brands promote "royal features." Birdies, a shoe brand favored by Markle, has seen itself become a much more widely known brand, but Bianca Gates, co-founder of the brand notes that, "The first time generated a 30,000-person waitlist; since then, it's become less of a surprise, but there's still a major spike." Practically speaking, a small brand also isn't likely going to be able to quickly ramp up production, without significant cost and time going into that. The article also points out that price point of the garments worn by Royals also plays a role in how well the buzz sustains itself. Which led us to the question, how have some of these brands performed after being seen on Meghan? Let's take a look. While Meghan likes her comfy Birdies slippers, she also steps out frequently (pregnant or not), in heels. Some of her favorite brands include Aquazzura, Manolo Blahnik, Stuart Weitzman, and Sarah Flint. So we took a look at one of her favorite styles, the Manolo Blahnik BB 105, to see if there's been any correlating increase in it selling out. It's important to note that this particular style is a classic - available in seasonal prints, suede, matte leather, and patent leather - which means it's constantly restocked. Meghan's been seen sporting the suede version, both in beige and black colorways. 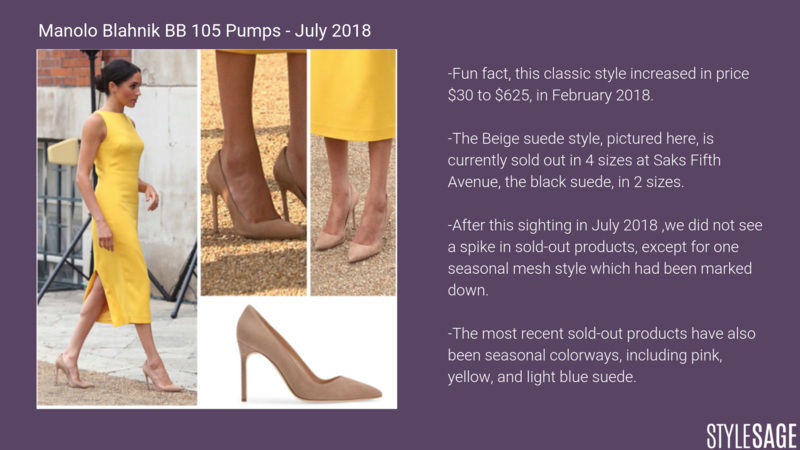 What we saw was that there were no corresponding spikes in completely sold out products (around the time she had worn these shoes) on retailers' sites, but rather small spikes in BB 105 styles that were seasonal and had already taken significant markdowns. Our verdict is there's likely little correlation between what we saw stock-out and the royal sightings. What's a royal without a beautiful frock? A very pregnant Meghan sported a sleeveless Victoria Beckham dress, earlier in March, to an event. It's made from a material called Cady that's luxurious and stretchy, and one that VB utilizes season-over-season, in different colors and sleeve lengths. This season it was served up in the trending chain-link print. A dress not widely available yet, how did it sell once it was spotted on Ms. Markle? Well, here we could say there's a pretty clear linkage to the "Markle Effect." 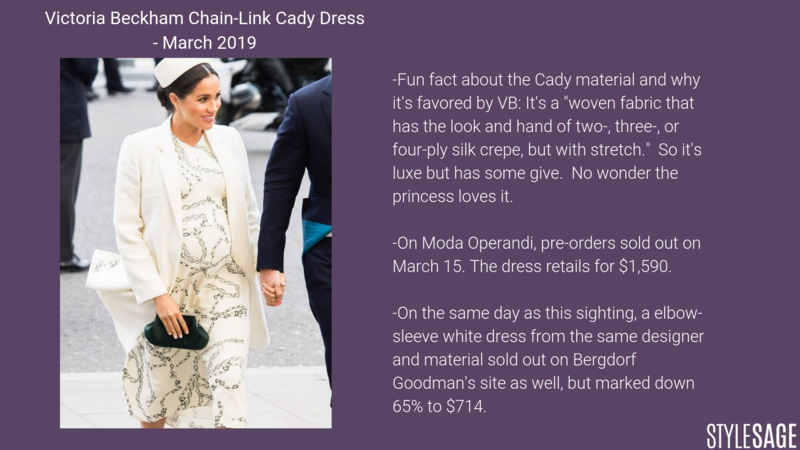 Available for pre-order on Moda Operandi (with a down payment of $795), the dress sold out just four days later, on March 15. As well, an elbow-length, white version of this same material sold out the same day as this sighting, though it had been marked down significantly, reduced 65% to $714. It's confirmed - everyone shops at Asos! The expecting mother donned a very affordable find from Asos, one that's made for all sizes including maternity, curve, and petite. Priced at $56 (in the US), what's not to love about this perfect everyday dress? Let's check out how it's performed since she wore it. 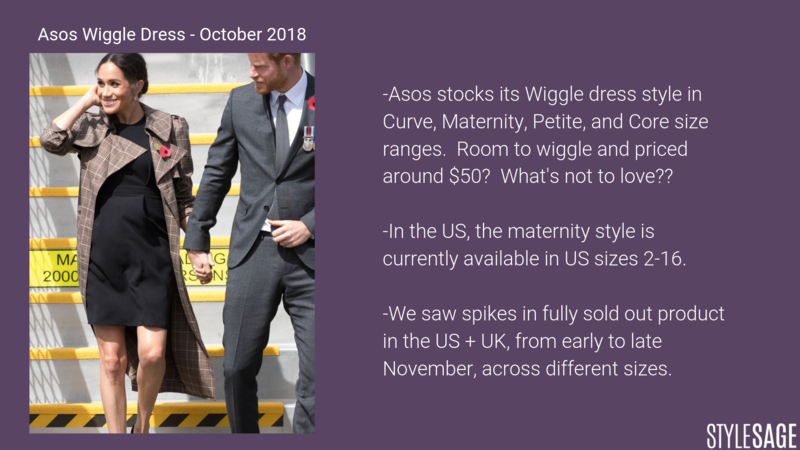 We saw spikes in the US and UK, across sizes, in fully sold out Wiggle dresses around November 7, 12, and 22, after her October dress sighting. Native to fast fashion trends, Asos shows us all how to balance scarcity with demand. The royal effect is certainly felt by fashion brands, and we have to wonder, will the royal baby also strike the same level of fashion fervor? We'll soon find out! Note that our data is pulled from a selection of retailers to give an indicative sample size, but may not represent every single retailer or marketplace selling a selected product.